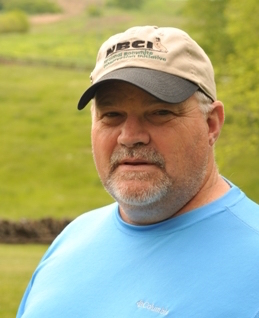 Steve Chapman, a Certified Forester and a Georgia Registered Forester with 30 years of experience and a reputation of working closely with Georgia Wildlife Division biologists to create wildlife habitat in forested settings, has been selected as the new forestry coordinator for National Bobwhite Conservation Initiative (NBCI). Chapman will promote NBCI’s forested grassland habitat objectives for bobwhites and other grassland birds at national, regional and state levels, including serving as a liaison and technical resource for state, federal and other conservation entities, engaging the U.S. Forest Service at regional and national levels to increase opportunities for bobwhite habitat projects and working to improve forest management and prescribed fire policies in support of forested grasslands habitat range-wide. A graduate of the University of Georgia’s Warnell School of Forestry and Natural Resources with a B.S. in Forest Resources, Chapman worked with the Georgia Forestry Commission for 27 years before launching his own habitat management services company. Chapman is active in the Society of American Foresters, serves on the board of his local chapter of the National Wild Turkey Federation, was a principal in the development of the first Longleaf Academy, served on the Natural Resources Conservation Service’s (NRCS) State Technical Committee and was a member of the Southeastern Forestry and Wildlife Working Group. “This is an amazing opportunity to be a part of something historic in wildlife conservation in this country and I’m excited to be a part of it,” said Chapman. NBCI Director Don McKenzie said the role of the forestry coordinator is critical because NBCI has identified much of the potential for bobwhite habitat restoration to be on forested lands. “Our efforts in the forestry arena have already resulted in the formalization of the new Shortleaf Initiative as an independent entity, but we still have a lot more work to do to achieve our forest management-related habitat goals. “For the first time in NBCI’s history we are fully staffed, all in positions identified as critical to our mission by the National Bobwhite Technical Committee. We now have a science coordinator, a communications director, an agriculture liaison in Washington, D.C., a grasslands coordinator, a spatial data analyst and now a new forestry coordinator…and some resources for them to be effective. This will allow us to pursue all of our habitat restoration strategies for wild bobwhites, especially the forest, grazing lands, cropland components, much more aggressively than before and be of greater value to the 25 NBCI member states,” McKenzie said. Chapman, who will work from his office in Milledgeville, GA, can be contacted at schapm16@utk.edu or 478-451-9114. 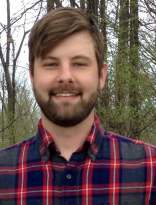 The National Bobwhite Conservation Initiative (NBCI) has hired a researcher from Southern Illinois University (SIU) Carbondale, Derek Evans, as the program’s new data analyst. Evans will begin work April 16. Evans has a B.S. and an M.S. in forestry from SIU, and brings several years of experience in field research and using a range of software programs and programming languages to build, access and automate natural resource databases. Among his responsibilities will be managing the NBCI 2.0 ArcGIS database, assisting states in planning and implementing NBCI focal areas, developing databases, programs and software tools that will aid states with NBCI focal areas and other projects, and working with NBCI Science Coordinator Tom Dailey and the Research Subcommittee of the National Bobwhite Technical Committee on various other needs. Evans will be headquartered with the Information Technology Services (ITS) unit of the University of Tennessee’s Institute of Agriculture in Knoxville. “This is an exciting opportunity for our group” said Chief Information Officer Robert Ridenour. To learn more about NBCI focal areas, visit https://bringbackbobwhites.org/strategy/nbci-2-0 and scroll down to Coordinated Implementation Program. To learn more about NBCI 2.0 ArcGIS data, visit http://databasin.org/ and search on NBCI. The Kentucky Department of Fish & Wildlife’s new five-year benchmark report on their 10-year bobwhite restoration plan is evidence that large-scale habitat restoration is not only possible, but it is the answer to the bobwhite decline and should be viewed as a model, says National Bobwhite Conservation Initiative (NBCI) Director Don McKenzie. Kentucky used basic habitat renovation techniques – but on a large scale — primarily prescribed burning and herbicide applications, but also plantings of native grasses and wildflowers, mowing, disking and cattle grazing. In the state’s five formally monitored quail focus areas, bobwhite increases ranged from 14% in the Livingston County Quail Focus Area to 779% in the Hart County Quail Focus Area in the first five years. 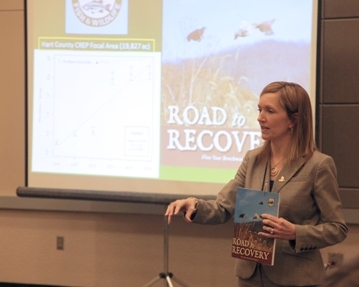 Kentucky Department of Fish & Wildlife Resources Commissioner Gregory Johnson and Deputy Commissioner Dr. Karen Waldrop (shown) updated the NBCI Management Board on the state’s bobwhite restoration at its meeting during the North American Wildlife & Natural Resources Conference in Omaha, Nebraska recently. The board is comprised of director-level representation from the wildlife agencies of the 25 NBCI member states and is a key policy group for the state-driven national initiative. Biologists say in the case of Livingston County they attempted to manage too much – 40,813 acres – as a focal area to be able to show quick results in just a five-year period with available resources. They have scaled the focus area down to 6,000 acres and made the remainder of the 40,813 acres the state’s first NBCI Bobwhite Focal Landscape. 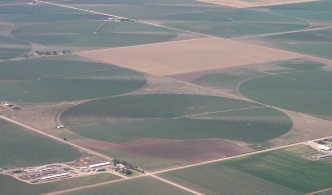 Biologists say success of the Hart County area was tied directly to large-scale habitat improvement – nearly 3,000 of the 19,827-acres of the total focal area – brought about by landowner participation in the Conservation Reserve Enhancement Program (CREP), which makes annual payments to landowners who voluntarily retire acreage … and, in this case, destroyed non-native fescue grass and re-planted native grasses and wildflowers. Biologists say it’s the largest grasslands restoration in the state’s history. Other focus areas included: the 2,855-acre Shaker Village Quail Focus Area, a 150% increase; the 21,860-acre Peabody WMA Quail Focus Area, a 56% increase; and 14,517-acre Bluegrass Army Depot Quail Focus Area, a 52% increase. The sixth of the state’s focal areas, the 14,416-acre Clay WMA Quail Focus Area, was not part of formal monitoring efforts during the first five years, but biologists say covey flush rates have jumped 300% since 2010. Headquartered at the University of Tennessee Institute of Agriculture’s Department of Forestry, Wildlife and Fisheries, NBCI is an initiative of the National Bobwhite Technical Committee (NBTC) to elevate bobwhite quail recovery from an individual state-by-state proposition to a range-wide leadership endeavor. The committee is comprised of representatives of 25 state wildlife agencies, various academic research institutions and private conservation organizations. 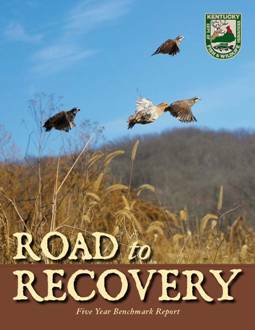 Support for NBCI is provided by the Federal Aid in Wildlife Restoration Program, state wildlife agencies, the University of Tennessee and Park Cities Quail. and on range management with the recent hire of a new “grasslands coordinator” to work with resource managers and constituent groups at national and regional levels. Jef Hodges, a Missouri-based wildlife biologist with experience in the commercial native plant seed market as well as years of experience in leading bobwhite habitat development across a broad section of the U.S., will work to build partnerships among the livestock industry, forage/range groups and extension agents to bring wildlife benefits that come with native plants back to agricultural operations. 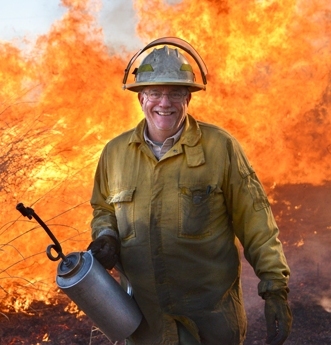 He will also build an information clearinghouse on native grasslands, grazing lands, and prescribed fire. A certified wildlife biologist, Hodges has a B.S. in Fisheries and Wildlife from the University of Missouri and worked with the Missouri Department of Conservation in native grass restoration, as a plant manager and marketer with a native seed company in Missouri, as a regional director and biologist (covering Missouri, Kansas, Iowa, Nebraska, Minnesota and Wisconsin) with the former Quail Unlimited conservation group, and owner/manager of his own company, Total Resource Management, LLC. He is a certified technical service provider by the Natural Resources Conservation Service (NRCS), serves on the NRCS State Technical Committee in Missouri, the Missouri Prescribed Fire Council and is a member of the Quail and Upland Wildlife Federation, Quail Forever, the Conservation Federation of Missouri and the Quality Deer Management Association. He was Quail Unlimited’s Top Regional Director in 1996 and Employee of the Year in 2000. Headquartered at the University of Tennessee Institute of Agriculture’s Department of Forestry, Wildlife and Fisheries, NBCI is an initiative of the National Bobwhite Technical Committee (NBTC) to elevate bobwhite quail recovery from an individual state-by-state proposition to a range-wide leadership endeavor. The committee is comprised of representatives of 25 state wildlife agencies, various academic research institutions and private conservation organizations. Financial support for NBCI is provided by the Federal Aid in Wildlife Restoration Program, state wildlife agencies, the University of Tennessee and Park Cities Quail. For more information, please visit www.bringbackbobwhites.org. The National Bobwhite Conservation Initiative (NBCI) and the Theodore Roosevelt Conservation Partnership (TRCP) have joined forces in the nation’s capital to address national issues critical to wild bobwhite restoration. TRCP Senior Director of Science and Policy Tom Franklin will be the 25-state bobwhite initiative’s “face” in the nation’s capital. 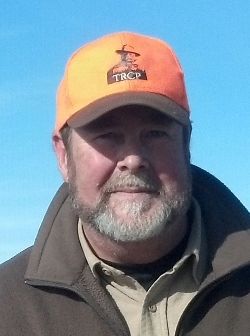 A certified wildlife biologist, Franklin has extensive experience in conservation policy and is widely known in Washington, including as field director and policy director of The Wildlife Society for 22 years, and in his role on the Wildlife and Hunting Heritage Conservation Council advising the secretaries of the US Departments of Agriculture and Interior. “The Theodore Roosevelt Conservation Partnership is excited to partner with NBCI and help advance national policies that restore bobwhite habitat,” said Whit Fosburgh, TRCP President and CEO. Franklin will fill the position of Agriculture Liaison for the NBCI, working as support staff and implementation leader for the Agriculture Policy Subcommittee of the National Bobwhite Technical Committee, the technical brain trust behind the NBCI. Inspired by the legacy of Theodore Roosevelt, the TRCP is a coalition of organizations and grassroots partners working together to preserve the traditions of hunting and fishing. For more information, please visit http://www.trcp.org/. Park Cities Quail (PCQ) is a 501(c)3 non-profit organization run by Dallas, TX-area volunteers who are passionate about our sporting tradition and are determined to make it available to future generations. By being completely volunteer, we are able to donate virtually 100% of every dollar raised towards quail research and youth education. In the past eight years this group of individuals has raised and donated over $4,500,000 directly to our cause! PCQ also spawned Quail Coalition, a statewide organization which now boasts 13 chapters and over 4,000 members. For more information, please visit http://www.parkcitiesquail.org/. “After many years of effort we got the pivot-corner practice we have been asking FSA to authorize in the Continuous CRP!” said NBCI Director Don McKenzie. “This new practice is a direct result of persistent efforts by the NBCI and our founding group, the National Bobwhite Technical Committee, who led the national campaign for this practice. Although ultimate success of this practice depends on the level of landowner enrollment in priority bobwhite conservation regions, it has potential to be a very big deal for bobwhites and numerous other species in landscapes dominated by center-pivot irrigation. It’s another major win for the NBCI, NBTC, state wildlife agencies and birds! !” FSA has already made some 250,000 acres available nationally to be enrolled in the new practice. Every NBCI state except West Virginia can potentially benefit, with approximately 17.6 million acres of cropland irrigated with center pivot systems in 24 NBCI states. A unique new partnership between the National Park Service (NPS), the Arkansas Game & Fish Commission (AG&FC) and the National Bobwhite Conservation Initiative (NBCI) is providing a new dimension to national efforts to restore declining wild bobwhite quail populations on a landscape scale. Working cooperatively, the three organizations will establish the nation’s first NBCI Bobwhite Focal Area ever located on National Park Service land, the 4,300-acre Pea Ridge National Military Park (Pea Ridge) in northwestern Arkansas, near the Missouri border. other grasslands wildlife species—have plummeted over the past decades because of habitat decline. NBCI is working to establish large-scale “focal areas” where habitat—and the birds—can be restored to demonstrate that recovery of bobwhites and other grassland songbirds and wildlife is possible given proper habitat management at the proper scale. The plan is to establish a large healthy resident population of bobwhites that can be a source population that will expand to neighboring properties if the habitat is there. The three partners will also work cooperatively on the development of interpretive and educational materials. Pea Ridge will serve as a location for public education and outreach. “This partnership is an excellent opportunity for Pea Ridge to benefit from the expertise and knowledge of both of these outstanding organizations. It will promote large landscape conservation, and will support, protect, and provide for the restoration and preservation of our cultural landscape. As we approach our National Park Service Centennial, this is an excellent time to work with our partners on restoring the bobwhite habitat.” said Superintendent Kevin Eads. “Rural agricultural settings in this era were bobwhite habitat,” said NBCI Director Don McKenzie. “The park has already recorded some bobwhite response from its vegetation management work and has chosen the bobwhite as an ‘indicator’ species to help measure their success. That the NPS is willing to work with us to achieve mutual goals is a huge step for the restoration of wild bobwhite populations along with other grassland songbirds and wildlife species in Arkansas … and possibly other states in the future,” said NBCI Director Don McKenzie. “It’s also an unparalleled opportunity to reach the public with the story about what has happened to not only bobwhites but also other grasslands wildlife species in this country … and why. We hope this is just a first step in working with the National Park Service wherever we have mutual objectives,” McKenzie said. Pea Ridge National Military Park is a 4,300-acre Civil War Battlefield that preserves the site of the March 1862 battle that saved Missouri for the Union. On March 7 and 8, nearly 26,000 soldiers fought to determine whether Missouri would remain under Union control, and whether or not Federal armies could continue their offensive south through the Mississippi River Valley. Major General Earl Van Dorn led 16,000 Confederates against 10,250 Union soldiers, under the command of Brigadier General Samuel R. Curtis. Van Dorn’s command consisted of regular Confederate troops commanded by Brigadier General Benjamin McCulloch, and Missouri State Guard Forces commanded by Major General Sterling Price. The Confederate force also included some 800 Cherokees fighting for the Confederacy. The Union army consisted of soldiers from Iowa, Indiana, Illinois, Missouri, and Ohio. Half of the Federals were German immigrants. The park also includes a two and one-half mile segment of the Trail of Tears. The Elkhorn Tavern, site of bitter fighting on both days, is a National Park Service reconstruction on the site of the original. 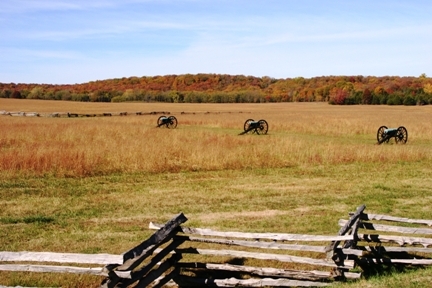 The park is one of the most well preserved battlefields in the United States. More information can be found on the web at http://www.nps.gov/peri or on Facebook at https://www.facebook.com/pages/Pea-Ridge-National-Military-Park/221857251198706. 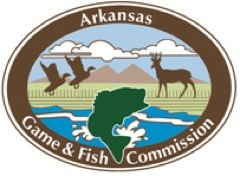 The Arkansas Game and Fish Commission manages wildlife and natural habitat, and sets hunting, fishing and trapping regulations. It works with local, state and federal groups to enhance conservation efforts, and educates the public about the importance of healthy wildlife populations and their habitats. For more information visit www.agfc.com. Headquartered at the University of Tennessee’s Institute of Agriculture/Department of Forestry, Wildlife and Fisheries, NBCI is an initiative of the National Bobwhite Technical Committee (NBTC) to elevate bobwhite recovery from an individual state-by-state proposition to a range-wide leadership endeavor. The committee is comprised of state wildlife agencies, academic research institutions and private conservation organizations. Financial support for NBCI is provided by the Federal Aid in Wildlife Restoration Program, state wildlife agencies, the University of Tennessee and Park Cities Quail. For more information, please visit www.bringbackbobwhites.org, on Facebook at https://www.facebook.com/bringbackbobwhites, on YouTube at https://www.youtube.com/user/BringBackBobwhites and on Slideshare at http://www.slideshare.net/bringbackbobwhites. The National Bobwhite Conservation Initiative (NBCI) is moving to hire a new forestry coordinator for the 25-state effort after their first coordinator was recently hired to direct the new Shortleaf Pine Initiative. The job announcement and description can be accessed on the NBCI’s homepage atwww.bringbackbobwhites.org, along with similar information for the new grasslands coordinator and data analyst positions. McKenzie says NBCI is looking for a forester with a wildlife background or a wildlife biologist with a strong forestry background. Preference will be give to those with a basic understanding of the ecological and economic aspects of integrating bobwhite management into forested habitats and who are very familiar with the NBCI and the NBTC, and with state wildlife and forestry agency structures and functions. The forestry coordinator will work primarily at regional and national levels as a liaison with and technical resource for a variety of entities, so is expected to travel extensively. The National Bobwhite Conservation Initiative (NBCI) is taking the next big step necessary in fulfilling its mission following its recent designation of eligibility for Federal Aid in Wildlife Restoration support from the states – hiring a spatial data analyst. An announcement for the position is posted on the University of Tennessee website. Application deadline is December 8. The analyst, which has been in NBCI’s action plan for 3 years, will be part of the NBCI Coordinated Implementation Program (CIP) — designed to achieve a consistent approach in developing and monitoring bobwhite focal areas across the range — and will lead to the development of a centralized national data warehouse, and better services to the states in the design, implementation and analysis of NBCI bobwhite focal areas. “Most NBCI data is spatial, based on the software program, ArcGIS,” said NBCI Director Don McKenzie. “As such, we will be able to more fully develop the NBCI 2.0 Conservation Planning Tool for easier use by NBCI member states and other partners.” These data are currently available via the Conservation Planning Atlas of the Gulf Coastal Plains and Ozarks Landscape Conservation Cooperative,http://gcpolcc.databasin.org/. “With the adoption of the CIP and the designation of NBCI as a Pittman-Robertson eligible national project, along with the resources that provides, bobwhite conservation has a new look, a stronger foundation of leadership by the states and new momentum. Filling this position is the next big step,” McKenzie said. Questions about the position can be directed to Thomas V. Dailey, Ph.D., assistant director/science coordinator, National Bobwhite Conservation Initiative, tdailey7@utk.edu, (573) 881-1782; or Robert Ridenour, executive director, Information Technology Services, University of Tennessee, Institute of Agriculture, ridenour@tennessee.edu, (865) 974-8630. Applauding the news, the director of the National Bobwhite Conservation Initiative (NBCI) says the formal launch of the new Shortleaf Pine Initiative at the University of Tennessee is a “major victory” for bobwhite restoration … even if NBCI is losing its own forestry coordinator in the process. The university recently announced establishment of the Shortleaf Pine Initiative and the hiring of NBCI Forestry Coordinator Mike Black as its director. The initiative is aimed at restoring much of the shortleaf pine savannah ecosystem across its range. The effort is supported by the U.S. Forest Service, UT and the Tennessee Division of Forestry. “In 2010, NBCI targeted the launch of a major national initiative for shortleaf pine savannah ecosystems, similar to the ongoing longleaf pine initiative, because these ecosystems were historically so important to widespread bobwhite populations,” said NBCI Director Don McKenzie. “And the forested landscape, especially southern pine forests, is where we see the majority of opportunity for bobwhite restoration to exist. Only four years after setting that goal not only has NBCI been successful in leading the launch of that shortleaf pine initiative, but we also have our own passionate quail guy, Mike Black, who served as our forestry coordinator, as its new director. Black, working on behalf of the NBCI, was a key champion in the conception, development and culmination of the initiative. “And although we certainly hate to lose Mike, he isn’t the first and I suspect he won’t be the last. But each of our departing staff went to their new job as a champion for bobwhites and for NBCI, and in a position to help us advance our cause. We know Mike will do the same. Consequently, NBCI’s influence and impact across the bobwhite range only continues to grow,” said McKenzie.